3 Key points you’ll need in order to achieve total transformation. As a Pilates instructor I often get the question “How often should I be doing Pilates (in a week)? Although these questions are common, and beg a simple straightforward answer, they can be a bit complex and existential, and very subjective per client and body. As clients we turn to our Pilates instructor to give us the best possible programme in attaining the goals we have in mind for ourselves and more often than not those goals are aesthetically based, and the instructor ends up detecting other problems or imbalances we had no idea existed. This article won’t touch upon rehabilitative Pilates utilised by osteopaths, therapists and physios, rather we’ll discuss Pilates from a fitness point of view which ultimately was Joseph Pilates initial main objective. 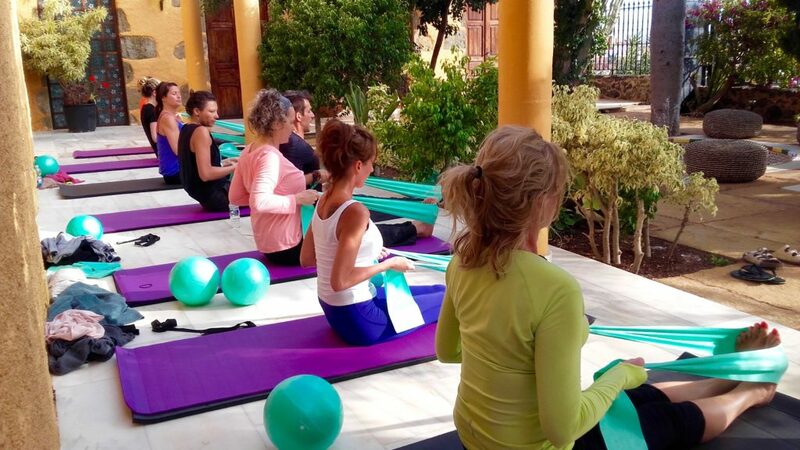 More often than not the wonderful clients we receive at our Sky Pilates and Yoga retreats are fully mobile adults that are work stressed and need to get away for a healthy break or wellness retreat. After partaking in our authentic classical Pilates classes they quickly realise these are not your everyday mat Pilates classes they’ve taken before at their local gym full of blue haired ladies on their backs moving one limb at a time blindly being lead by the recommendations of their GP. No. We strive to teach as close as possible to Joseph Pilates’s original philosophy and although the classical system may seem a bit “in-the-box” thinking, sometimes we have to conquer the exercises in the box before moving on to the ones outside the box. In other words thinking inside the box sometimes creates enormous benefits that later transcend to outside of the box. This leads us to the first error we may be commiting in our Pilates practice. You may not be practicing classical Pilates. Practice classical Pilates first then move onto progressive Pilates classes. You’ll maximise not only your knowledge of Pilates but your knowledge of your own body as well. In the Pilates world we tend to think of classical Pilates as the base or foundation of all human movement. Why? Because as humans we execute so much of our biomechanical movement, sport or exercise from the core and Pilates focuses directly on movement from the core of the body as well as the health of our spine which is vital in everything we do. It’s no wonder why so many professional athletes have taken to Pilates in the past 2 – 3 decades and have thus elongated their careers. Ever notice there are so many dancers turned Pilates instructors? There’s a reason why so many ballerinas/ballerinos take to Pilates whether early in their career or later. Classical Pilates is structured, much like ballet, with a particular order to the exercises as Joseph himself devised and they’re set that way for a particular reason, to bring you back to life or “Return to Life Through Contrology”, hence the title of his best seller. Contrology is the name he gave to his discipline, which later changed to his surname of Pilates. The amazing thing about Pilates is that every person regardless of age or gender can partake in classical Pilates. Classical Pilates is very challenging and although it seems like it’s not for everyone, indeed it is. Modifications can be given for either the beginner or the most advance practitioner but the process of the exercise itself does not change. As we progress from beginner to intermediate (improver) then to advanced are body thus transforms into the “Powerhouse” it’s always wanted to be. But in order to go through that transformation we must practice and repeat, and repeat, and repeat. How do you know if your Pilates class is classical or not? or how do you go about finding that classical Pilates class that will transform your body? Easy, ask your instructor if they’re classically based or ask them where they qualified. If they’ve done their qualifications programme in the UK or Europe most of the time they’re “progressive” based. This doesn’t mean a progressive programme doesn’t have merit or it’s advantages, it just means they begin by thinking of the exercises outside of the box first. There are many classical programmes, and classes, in the UK and Europe but you might have to search a bit more. Start by strengthening your knowledge of the exercises “in the box” first and you’ll further understand the exercises outside of the box, otherwise known as exercises that were not devised not by Joseph Pilates himself. I’ve been answering this question for years and now at Sky Pilates and Yoga Retreats it is our direct yet indirect message we attempt to convey to our clients. Imagine you’re learning a second or third language and you’re attending a language course. You go to your first day of class. You buy your required text book. You buy the materials you suppose you’ll need for class. You even buy flash cards in case the teacher requires them. You have an amazing first day learning simple greetings, nouns, verbs etc, but you know deep down this language is very rich, profound and it’s going to take several classes to even feel confident ordering food at a restaurant . You even consider going to that particular country to do a mini immersion because you’ve realised or you’ve been told immersion is the only way to really learn that language effectively and quickly, and besides who wants to wait years to become fluent in a new language? Now imagine that language is Pilates, because ultimately that’s what we’re learning, a language that our body(ies) hold and we’re just now learning after years on this planet. And to make things even more interesting, whilst you’ve been learning your “body” language, your instructor has learnt their own and yours! Therefore to answer that question, imagine you’re learning a new language and you know if you immerse yourself in that language you’ll learn it better, quicker and more efficiently. That then begs the question, “should I be doing Pilates everyday?” Yes, practically every day. The beauty of Pilates is you can actually do Pilates every day and your body will not only recover just fine, it will begin to accept that this new movement is the new norm and thus your transformation begins. Because Pilates exercises do not repeat, otherwise referred to as “sets” in the gym, we execute a few repetitions of one exercise and quickly move on to the next. This format allows for our bodies to recuperate faster and feel energised for the next day’s programme. Finally the third error we may be committing is we’re not moving enough. 3. Move more, rest less! Have you ever peaked into a Pilates class and thought there seems to be lacking a cardiovascular aspect? Perhaps this turned you off and you decided not to join the class or perhaps this further intrigued your curiosity and you signed up. Either way, lets tackle this perception. Some progressive classes can seem very slow and a bit laid back, but not classical Pilates. This doesn’t mean they’re not doing anything at all but I can say that Joseph Pilates himself intended for his his clients to move a lot! If you’ve seen some of his archival pictures and/or videos Joseph seemed like a mad man, standing atop his clients or moving very quickly from one exercise to the next. Simply put, he was a bit of a mad man but this is what made his fitness programme so popular and now completely mainstream. Joseph wanted his clients to work, to move, to explore physical fluid movement through space for a whole hour. He took persons from all walks of life and made them move, and for a whole hour his clients rested very little. In classical Pilates we rest little and move lots. There should exist natural transitions from one exercise to the next which thus produces a heightened level of cardiovascular activity and tends to leave most feeling a sense of equal exhaustion and satisfaction at that 60 minute mark. I’ve always said if you’re not sweating in the first 5 minutes, you’re not doing Pilates! Pilates is about transformation and transformation comes through hard work, whether that work is mental or physical or both. In order to transform anything rigorous work must be done in order to achieve beauty. That may seem very shallow but have you encountered anyone doing hard work to become what they consider the opposite of beautiful? Let’s remember beauty is as much internal as it is external and human beings are always in search of “beauty”. A caterpillar reaches near death, hanging on a limb, susceptible to becoming prey, just before metamorphosing into a beautiful butterfly. An Olympic athlete trains extremely hard for years in order to master his/her maximum potential to be able to compete in a global arena. They pride themselves in their training and their own perception of beauty is reflected not only internally but externally. Transformation into unhealthy is much easier than transformation to health. This ultimately is why we consider healthy lifestyle more attractive than a non healthy lifestyle. When you engage in a classical Pilates class, and begin your transformation, you may feel like Pilates does it all. Almost like you don’t need anything else in your busy week. In actuality what does happen is you feel stronger, more flexible, more agile and end up taking on something else like yoga, surfing, skiing, cycling and a number of wonderful activities. Rest assured, you’ll always know that coming back to your classical Pilates is at the core of your being and when your core is strong, you’re of strong mind and body.